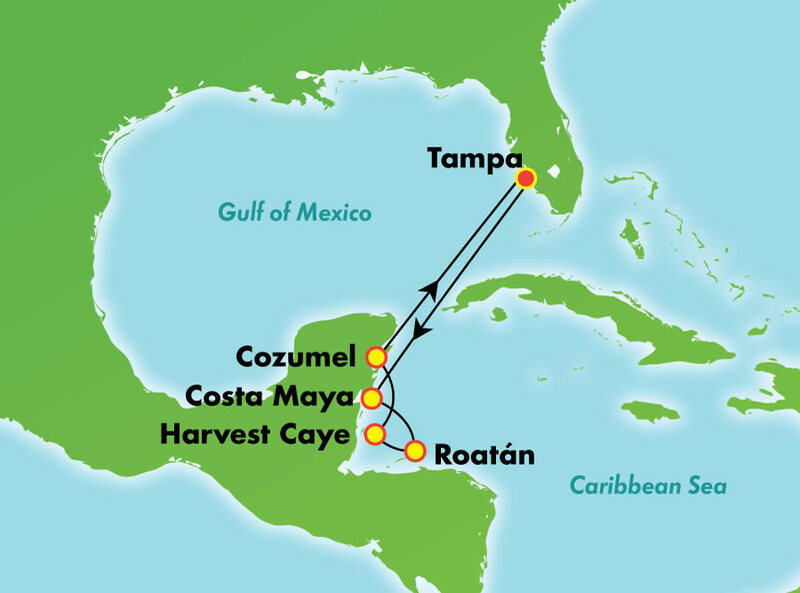 Harvest Caye, Belize - Belize is ideal for eco-tourism. With diverse ecology consisting of jungles, rainforests, swamps, coral reefs and so on, you will find solace and adventure in Harvest Caye's stunning landscape. Oceanview Porthole Window (OF) -With room for up to four guests, these Norwegian Star Oceanview Staterooms come with two lower beds that convert into a queen-size bed and additional bedding to accommodate up to two more guests, as well as a picture window with a great view. These are mid-ship staterooms, which means you'll be right near everything on board. Mid-Ship Inside (ID) -Great for up to four guests, these staterooms come with two lower beds that convert into a queen-size bed additional bedding to accommodate up to two more guests. Because these are mid-ship staterooms, you'll have easy access to everything fun and exciting on board. Prices are per person, based on double occupancy and subject to change. Port Charges, Taxes & fees, gratuities and travel protection are included. Deposit: $250 per person.